Ever since their debut, BTS has been on a mission to change the world – one song at a time. Unlike their K-pop counterparts who croon and dance to factory-made perfection, the seven-member juggernaut rebel against the norms with lyrical themes tackling social hierarchies, self-acceptance and empowerment, in the rawest and least filtered form. It’s no surprise they’d make the perfect role models for today’s generation, having joined forces with UNICEF to launch an anti-violence campaign dubbed Love Myself last October. “Thank you, Mr. Secretary General, UNICEF Executive Director, Excellencies and distinguished guests from across the world. My name is Kim Nam Joon, also known as RM, the leader of the group BTS. It’s an incredible honour to be invited to an occasion with such significance for today’s young generation. Last November, BTS launched the Love Myself campaign with UNICEF, building on our belief that ‘true love first begins with loving myself.’ We have been partnering with UNICEF’s #ENDviolence program to protect children and young people all over the world from violence. Our fans have become a major part of this campaign with their action and enthusiasm. We truly have the best fans in the world! I would like to begin by talking about myself. Looking back, that’s when I began to worry about what other people thought of me and started seeing myself through their eyes. I stopped looking up at the stars at night. I stopped daydreaming. I tried to jam myself into moulds that other people made. Soon, I began to shut out my own voice and started to listen to the voices of others. No one called out my name, and neither did I. My heart stopped and my eyes closed shut. So, like this, I, we, all lost our names. We became like ghosts. I had one sanctuary, and that was music. There was a small voice in me that said, ‘Wake up, man, and listen to yourself!’ But it took me a long time to hear music calling my name. Even after making the decision to join BTS, there were hurdles. Most people thought we were hopeless. Sometimes, I just wanted to quit. I think I was very lucky that I didn’t give it all up. I’m sure that I, and we, will keep stumbling and falling. We have become artists performing in huge stadiums and selling millions of albums. But I am still an ordinary, 24-year-old guy. If there’s anything that I’ve achieved, it was only possible because I had my other BTS members by my side, and because of the love and support of our ARMY fans. Maybe I made a mistake yesterday, but yesterday’s me is still me. I am who I am today, with all my faults. Tomorrow I might be a tiny bit wiser, and that’s me, too. These faults and mistakes are what I am, making up the brightest stars in the constellation of my life. I have come to love myself for who I was, who I am, and who I hope to become. I would like to say one last thing. After releasing the Love Yourself albums and launching the Love Myself campaign, we started to hear remarkable stories from our fans all over the world, how our message helped them overcome their hardships in life and start loving themselves. These stories constantly remind us of our responsibility. I would like to ask all of you. What is your name? What excites you and makes your heart beat? Tell me your story. I want to hear your voice, and I want to hear your conviction. No matter who you are, where you’re from, your skin colour, gender identity: speak yourself. Find your name, find your voice by speaking yourself. I’m Kim Nam Joon, RM of BTS. I’m a hip-hop idol and an artist from a small town in Korea. Like most people, I made many mistakes in my life. I have many faults and I have many fears, but I am going to embrace myself as hard as I can, and I’m starting to love myself, little by little. From seven young hopefuls who overcame all odds to realise their dreams, to becoming the voices of youths across the world, BTS has truly made history. Let’s admit it: we aren’t all blessed with Beyonce’s divalicious body rolls, and neither can we bust out a moonwalk as smoothly as Michael Jackson. But that doesn’t mean you can’t learn how to pick up choreography like a pro. We compiled a bunch of instructional videos that will help you to upgrade your get-down in no time. From popping to locking, to lesser-known forms like electric boogaloo and gangsta walk, here are some dope street dance styles you should know about. Originating from Chicago, this hyperspeed dance style may seem hard to master, but you can start off with some basic footwork steps like the ones in this video. There’s no narration to guide you through, but the moves are simple enough to follow for even the uncoordinated. A funk dance style that involves the tensing and relaxing of muscles to create a flow, popping requires a lot of repetition to get it right so we recommend practicing with one body part at a time. Learning how to pop your arms is a good place to start. Also known as clowning, it takes a great deal of energy and body control to keep up with this fast-paced dance form. Some basic krump moves are the stomps, chest pops, jabs and arm wings – and you can learn it all from fellow krumper BDash right here. This flashy B-boy stunt will no doubt score you a ton of swag points, but it’s important to do it properly to avoid slamming your kneecaps. Fret not – choreographer Mihran Kirakosian does a thorough explanation of each step in this detailed yet easy-to-follow tutorial. You’d have to be living under the rock if you haven’t heard of the viral shoot dance that originated from Tennessee-based rapper Blocboy JB. Unlike the other tutorials in this list, YouTube personality JustKryptic keeps it lighthearted and fun. It’s time to step it up. If you’ve already got the basics down, why not take your street dance game up a notch by learning the routines to some of the popular tracks on the charts? We’re going to be honest here: this one can be pretty tricky for beginners. But choreographer RainO breaks down the steps into slow, digestible chunks so you’ll be able to nail most of the routine by the end of it (after all, it’s 23 minutes worth of learning material). So everyone knows how to do the shiggy (#InMyFeelings challenge, anybody? ), except you… right? Well, now you can thanks to this Chop Daily tutorial! One of the first few K-pop acts to jump onto the shoot dance bandwagon, Pentagon’s take on the viral trend is fun, cheeky and oh-so-catchy. We particularly love RPM Dance Crew’s tutorial, which brings you through the steps in a raw yet concise manner – it’s almost as if you’re attending the actual dance class itself! With their fierce hip-hop attitude and eclectic style, BLACKPINK oozes girl crush vibes with every bop they put out – take their latest track ‘DDU-DU DDU-DU’ for instance. Fellow K-pop dancer Lisa Rhee has an entire tutorial on this, and the best part? Not only did she split up the routine into parts for easier learning, she also included both mirrored and slowed-down versions to help you along the way. Want to show off your best moves on the dancefloor? Sign up for NYP Groove! Street Dance Competition and you may just be the next street dance champ! Registrations are now open till 25 November 2018. 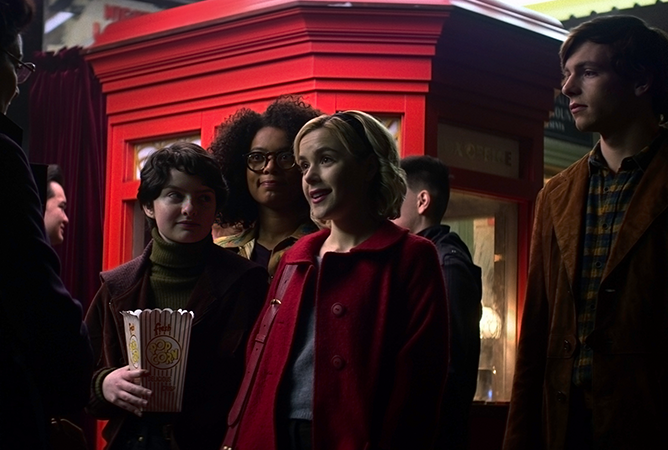 We’ve all heard by now that our favourite teenage witch will be making her way back onto our screens in an all-new Netflix Original series, Chilling Adventures of Sabrina. But here’s a heads-up: this isn’t going to be a reboot of the ’90s version we all grew up with, though some of the OG characters will be making a comeback (yes, Salem too). Based on the comic book series of the same name, get ready for a reintroduction to Sabrina Spellman in this dark coming-of-age tale filled with adventures steeped in horror, the occult, and of course, witchcraft. The story takes place in the present where Sabrina finds herself reconciling her dual nature as she stands against the constant evil forces that threaten her, her loved ones and the world she lives in. As we await to binge-watch this highly-anticipated series, here’s a quick crash course who’s who in the supernatural town of Greendale. Half-human, half-witch, Sabrina Spellman is an empowered young woman who is just beginning her dark education as a sorceress while trying to maintain a normal life as a sophomore at Baxter High. Intelligent, compassionate and brave to the point of recklessness, Sabrina is all that stands between humans and the forces of darkness that threatens the world. As Sabrina’s boyfriend, he’s the prince charming of this dark fairytale. Unlike Sabrina, Harvey Kinkle is a normal human dreamboat who’s the son of a coal miner. He is also completely unaware of the dark forces conspiring to keep him and Sabrina apart. 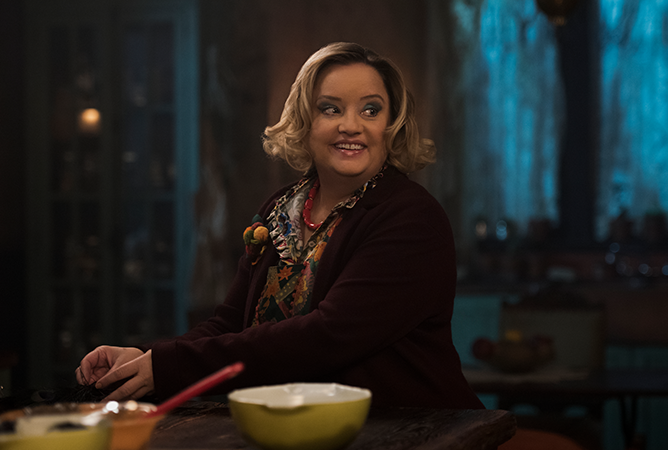 Known as the more nurturing one out of Sabrina’s two witch aunts, Hilda Spellman’s motherly nature and warm sense of humour belies a wicked, ghoulish streak. She is as adept at brewing spite jars against her family’s enemies as she is at concocting love potions for the students at Baxter High. 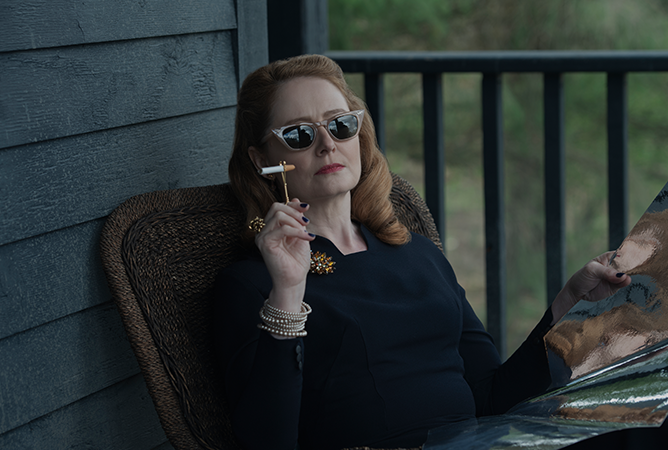 Proud and devout, Zelda Spellman is Sabrina’s sterner other witch aunt who believes that there is no greater honour than in serving the Dark Lord as a member of the Church of the Night. Aside from being the family’s disciplinarian, she is also fiercely protective of Sabrina and is very much Cain to Hilda’s Abel. Mary Wardwell is Sabrina’s favourite teacher and mentor at Baxter High. 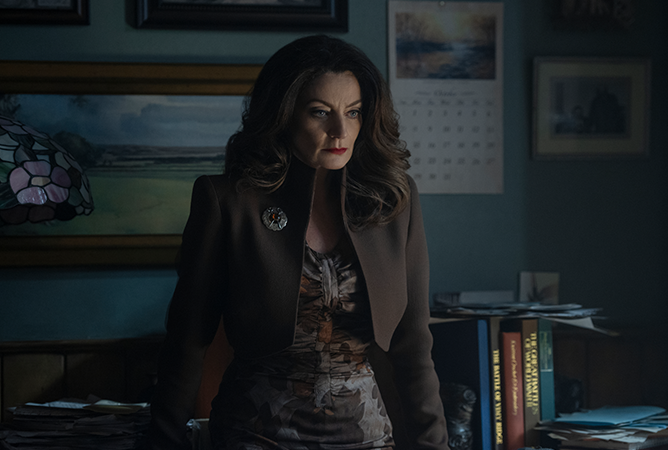 But when she gets possessed by the Devil’s handmaiden, Madam Satan, Miss Wardwell turns into a sultry, cunning manipulator who constantly tries to lure Sabrina down the dark Path of Night. 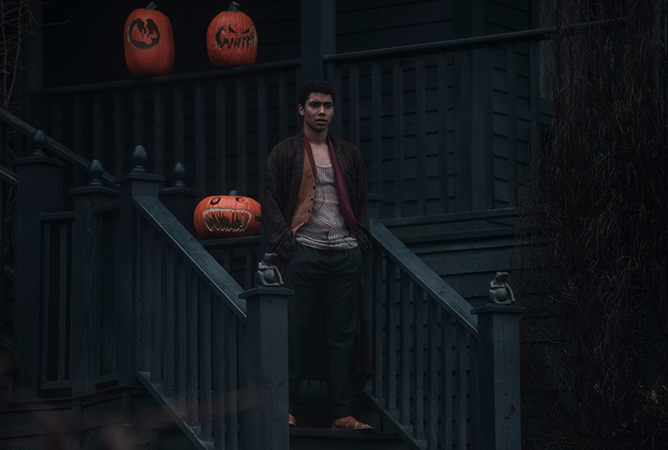 Hailing from England, Ambrose Spellman is Sabrina’s warlock cousin who had been placed under house-arrest by the Witches Council, where he is forbidden from leaving the funeral home where he lives with the Spellman women. 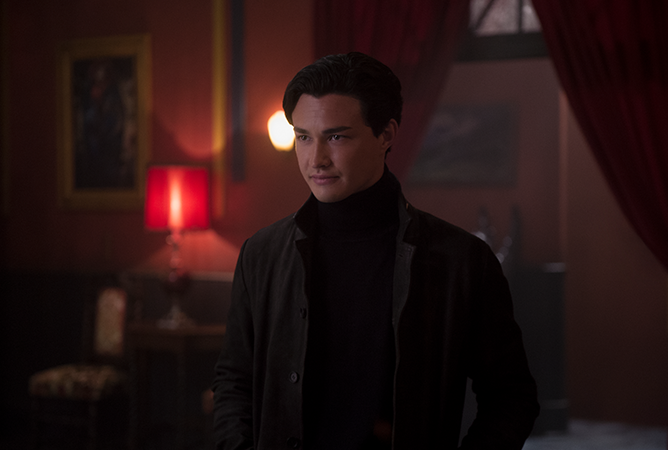 Witty and puckish, he is always up for mischief as one of Sabrina’s partners-in-crime. He is the High Priest of the Church of Night and Dean of the Academy of the Unseen Arts. 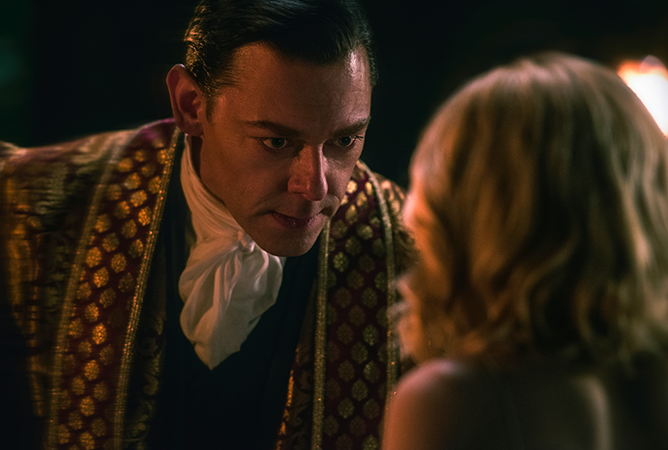 Ruthless and ambitious, Father Blackwood hides a terrifying dark agenda that, if discovered, will put him in a direct conflict with Sabrina and the other members of the coven. 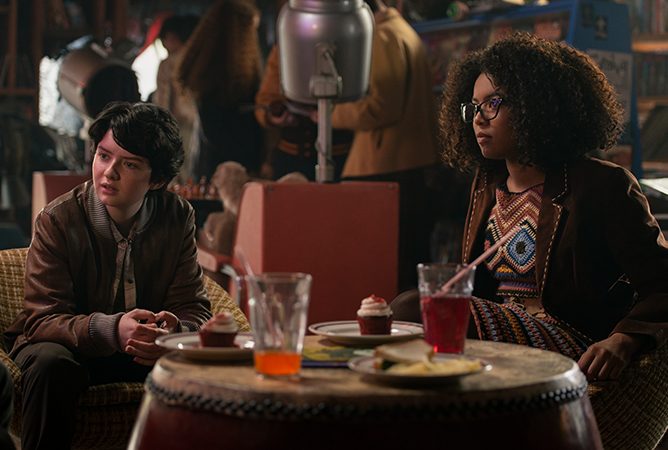 Susie Putnam is one of Sabrina’s friends at Baxter High and a founding member of the school’s newly formed WICCA club, whereas Rosalind Walker is Sabrina’s best friend whose father is a Greendale church minister. While Rosalind is known to be a brash, empowered and outspoken girl, Susie is brave and optimistic despite being bullied at school and living on a farm at the outskirts of town with a terrifying supernatural threat. He is a young and handsome warlock at the Academy of Unseen Arts. As a follower of Sabrina’s father’s teachings, Nicholas Scratch finds himself drawn to Sabrina, thus creating immediate sparks between them. 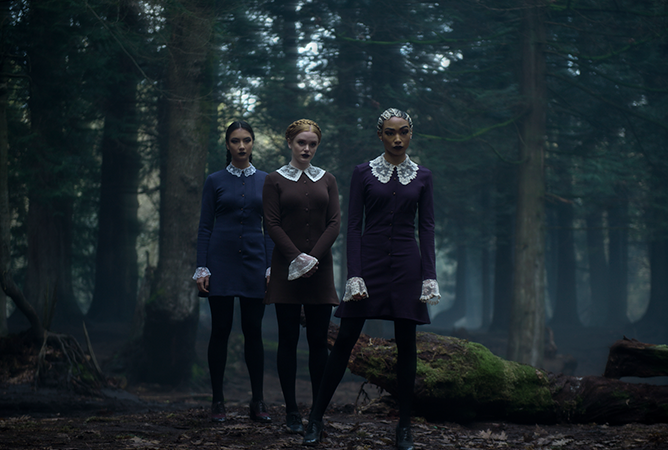 A trio of powerful and unusual teenage witches at the Academy of Unseen Arts who abhors the sight of Sabrina because she is half-mortal. Ready to get bewitched? 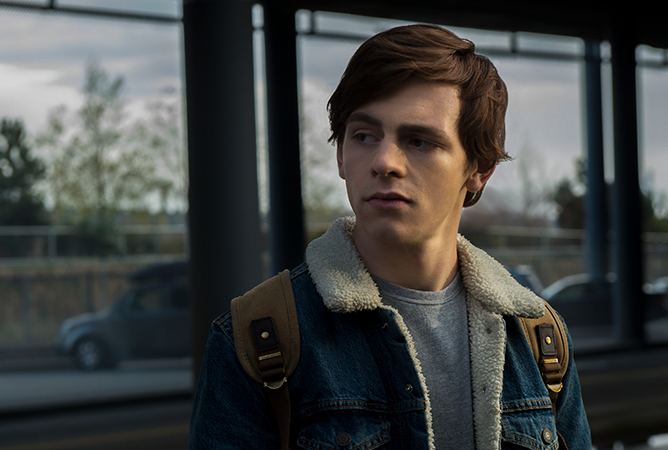 Don’t forget to catch the Chilling Adventures of Sabrina premiering on 26 October 2018, only on Netflix! It seems like Sunny and Wang Yeo are getting their very own epilogue story! Well, kinda. Previously, it was reported that Yoo In Na was in talks to star in the upcoming tvN drama Touch Your Heart alongside actor Jung Kyung Ho. 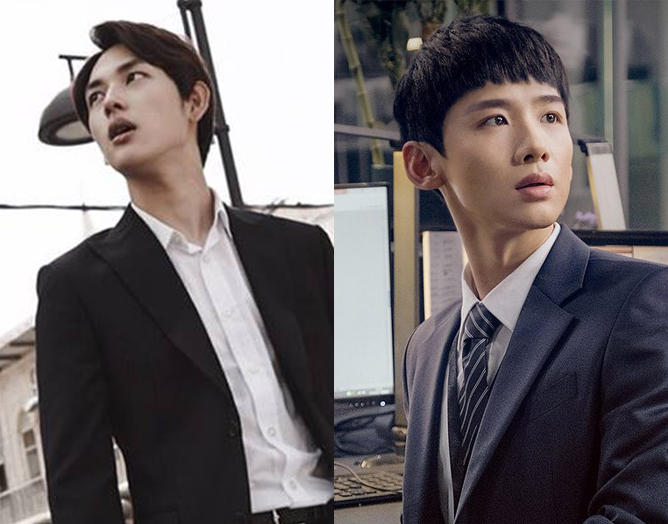 But bless the casting gods (no offence to Jung Kyung Ho, of course), as it’s now confirmed that her former costar Lee Dong Wook from the hit drama Goblin will be taking up the male leading role instead. Set to be directed by Park Joon Hwa who’s the brainchild behind What’s Wrong With Secretary Kim, Touch Your Heart is based off a web novel about fallen actress Oh Jin Shim whose career went up in smokes after getting herself involved in a dating scandal with a chaebol, and she ends up working as a secretary for the cold-hearted Kwon Jung Rok at a top lawyer firm. Just from the plot alone, it already sounds like an epilogue for Yoo In Na and Lee Dong Wook’s Goblin characters, who are reborn as an actress and a detective respectively in their next lifetime. If only Kwon Jung Rok’s a detective, right? But hey, we aren’t complaining – at least we get to witness the sizzling chemistry of our favourite onscreen couple again. After their heart-wrenching romance in Goblin, we hope these two will get their well-deserved happy ending in Touch Your Heart. And who knows, perhaps Kim Shin and Ji Eun Tak might even make a surprise cameo! Touch Your Heart is scheduled to premiere in January 2019. So you’ve just finished binging all the episodes of Meteor Garden, and now find yourself struggling to fill the F4-shaped void in your heart. As much as we ache for a sequel so we can find out how’s life like for newlyweds Dao Ming Si and Shan Cai – which most likely won’t happen anytime soon – we know it’s time to move on. To help you cure your post-Meteor Garden blues, here are some upcoming Chinese adaptations to watch out for. Who could ever forget the Taiwanese romcom classic that is Corner With Love? 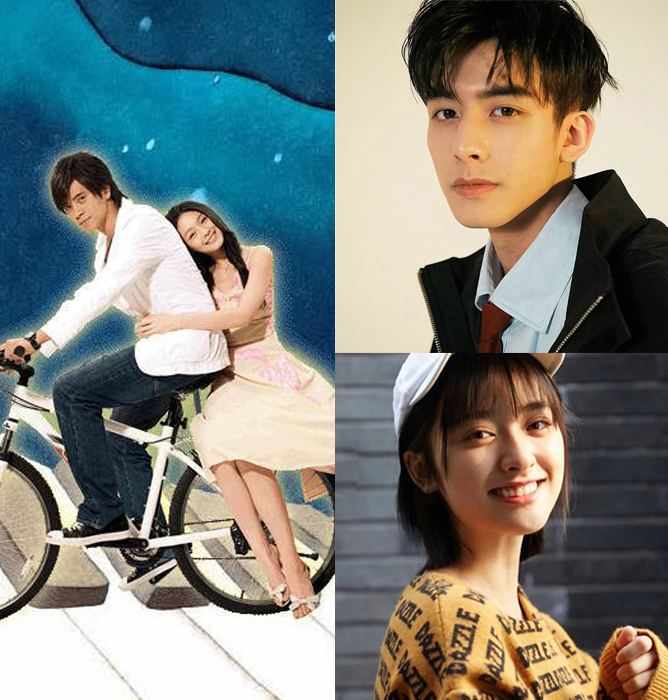 Bringing to life the iconic characters of Qin Lang (Show Lo) and Yu Xin Lei (Barbie Hsu) are actors of-the-moment Song Wei Long and Shen Yue, which will mark the latter’s second Barbie role after her stint as Shan Cai in Meteor Garden. 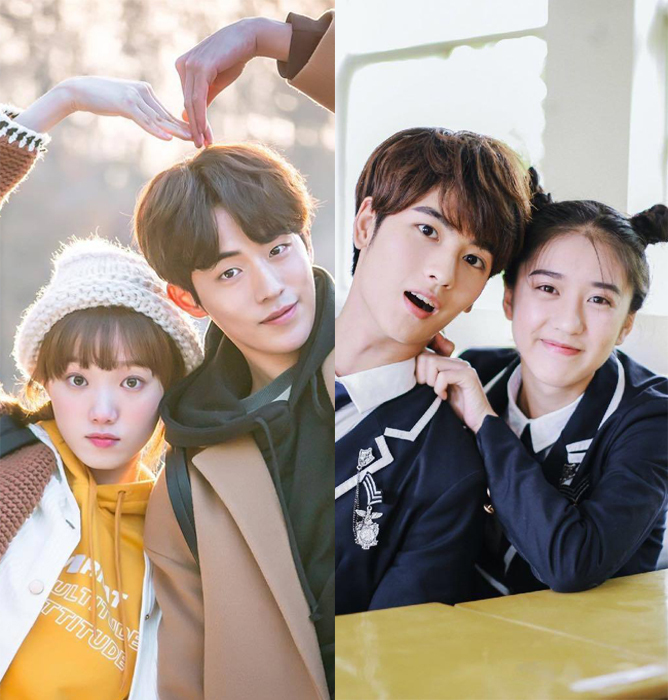 It’s no secret that Shen Yue has impeccable chemistry with all of her leading men till now, so we can’t wait to start swooning over these budding onscreen lovebirds (sorry Dyshen shippers). A coming-of-age sports drama featuring Lee Sung Kyung as a happy-go-lucky weightlifter and Nam Joo Hyuk as your typical tsundere swimmer, Weightlifting Fairy Kim Bok Joo is one of those feel-good shows that you can watch for hours on end and never get bored. When news of a Chinese remake first came out, speculations swirled that Shen Yue will be taking on the role of Kim Bok Joo, but her manager was quick to put an end to the rumours. Other dream castings include Guan Xiao Tong, Zhao Lu Si and our very own Eleanor Lee, daughter of local actress Quan Yi Fong. We don’t know about you, but we think Eleanor Lee and her The Big Boss costar Huang Jun Jie can give our OG couple a run for their money. One of the most successful and highly-rated Korean dramas to date, the 2014 series depicts the story of an aspiring go player played by Im Si Wan, who’s thrown into the cold reality of the corporate world. Titled Original Glory, the new remake is set to air in 2019 with a total of 42 episodes and stars Bai Jing Ting as the titular character. Prince of Tennis needs no introduction. First started as a Japanese manga series, it has since spawned various adaptations including an anime series, stage musicals, video games and two Chinese dramas. Nabbing the role of tennis prodigy Ryoma Echizen is Peng Yu Chang, and we couldn’t think of a better actor to do the character justice than Peng Peng. We’re basically seeing double! The 2014 Korean adaptation of Japanese manga Nodame Cantabile set the bar pretty high, so we’d be lying if we said we don’t have high hopes for the upcoming Chinese remake. 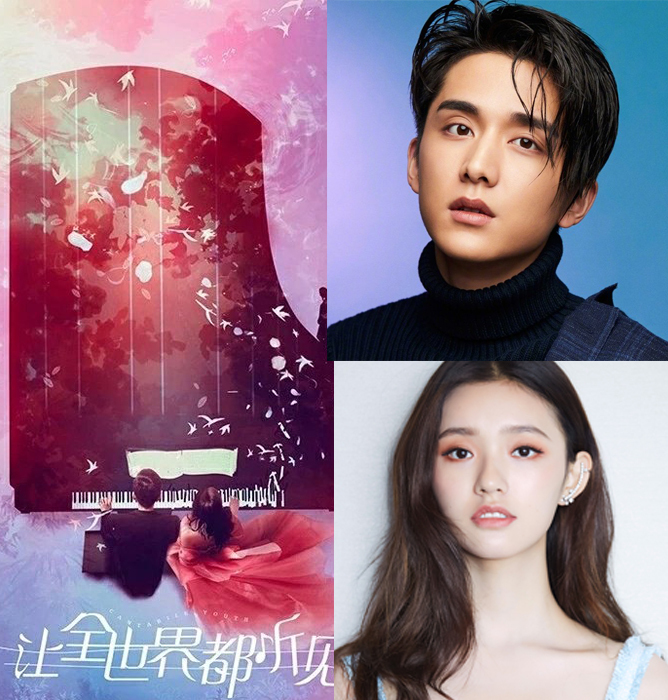 The music-themed romance drama (titled Cantabile Youth) is said to have a total of 60 episodes, with Zhang Xin Cheng and Lin Yun taking on the roles of Chiaki and Nodame. Which Chinese remake are you looking forward to the most? Tell us in the comments below!